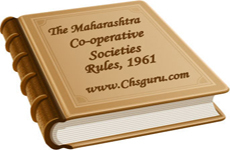 Cooperative societies including housing societies have to be encouraged by appropriate statutory provisions and procedural rules by every State and Union Territory to operate under democratic member control and with autonomy. This is the latest constitutional direction laid down by Indian Parliament by inserting “Part IXB: The Cooperative Societies” in the Constitution of India vide the Constitution ( 97th Amendment ) Act 2011 made effective on 13 2 2012. Members join the society voluntarily but separation may not be voluntary as the State laws cast certain duties on members to participate in the society affairs to certain minimum level and carelessness may costs him the membership resulting in involuntary separation. In a housing society a member joins housing society as that is the only option left to have a dwelling place. Whether he occupies the flat himself or sub-let or let it remain vacant he is liable to pay maintenance bills like other members. The language of the Rule indicates a MANDATE that a member MUST be expelled from the society ‘for the reasons mentioned in section 26 of the Act,” in accordance with the provisions of sub-section (i) of Section 35. For expulsion of a member Section 35 of the M C S Act 1960 requires a resolution passed by a majority of not less than three-fourths of the members entitled to vote who are present at a general meeting held for the purpose expel a member. DOES section 35 throws the matter of expulsion back to a democratic member control, not withstanding a direction under Rule 28 that a member be expelled from the society for the reasons mentioned in section 26 of the Act as quoted above. If three fourth of the members present in a meeting called for that purpose do not pass an expulsion motion, what happens? Are the guilty of breach of the mandate under Rule 28? For a change cooperator fraternity is invited to offer their views backed by logic. Co-op Bank: Can my mother get pension?